Hi everyone, and welcome to this new edition of the Language Creation Tribune. Once again, thanks to Jessie Sams and the other editors for putting it together. Ironically, for people whose hobby is to create languages, we tend to have issues with communication. I myself am no stranger to it, as people on the Conlang Mailing List know. I’ve participated in my share of flamewars! 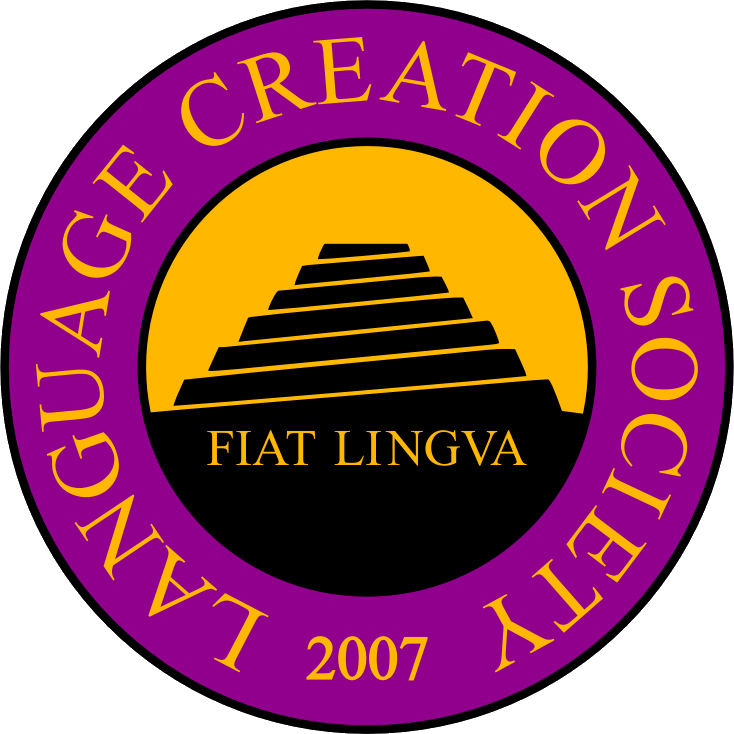 The early history of the Language Creation Society is also fraught with misunderstandings, which left a bitter taste in the mouths of some people. So when I became President of the LCS, my number one priority was to enhance the LCS’s communication efforts, both towards its own members (this newsletter is, I hope, a good first step in that direction) and towards the conlanging community at large, as well as to reframe it the way it should be: the LCS is not here to “lead” the conlanging community (whatever that may mean), but to serve it. But if I want to enhance communication between the LCS and the conlanging community, I must also be present where conlangers are so that they can easily reach me. While I am active on the Conlang Mailing List and can be reached by email, I am also on Twitter (@Tsela) and on Google+. And to put my money where my mouth is, so to speak, I also, despite some misgivings, joined Facebook a few months ago. With the LCS itself present on all these fronts as well (Twitter, Facebook, Google+), we can reach conlangers far and wide in the social media sphere. But we are still missing a lot of conlangers out there. For instance, there is a vibrant and young conlanging community on Tumblr, composed of people who are only rarely present on other social media, and so far the LCS has ignored it entirely. It’s time to correct that mistake. And while we are still busy setting up an official LCS Tumblr blog, I have personally decided to join Tumblr as well. My personal Tumblr site is at http://christophoronomicon.tumblr.com/, and while it’s not all about conlanging (a lot is about dogs! ), I do talk about conlanging a lot there, and I answer all the questions I receive via that site. So if you are on Tumblr and want to contact me, you can now do it directly on Tumblr itself. And if you want me to follow you there, just drop me a line! Naturally, we at the Language Creation Society will only know whether our efforts are successful if we get feedback from you. So don’t hesitate to contact us! Whether it is by email, Twitter, Facebook, Google+, Tumblr, this newsletter’s comments, or even with smoke signs, do tell us what you think! And if you have ideas to improve the LCS’s services, don’t hesitate to let us know! Recently I came across young LCS member David Tait’s Hopyratian Grammar, created as part of his Sepistania con-world. While Hopyratian is a fairly new conlang and remains to be more fully developed (the online grammar is a relatively scant 25 pages with no separate lexicon/vocabulary given), it nevertheless shows some of the fascinating quirks I look for in natlang-style conlangs. In the case of Hopyratian, this includes a script that looks half rune-like and half katakana-like, some nifty oddities to its romanization scheme (“x” is a voiceless interdental fricative and “y” is silent if between two consonants or before an “a” or an “ā”), a proximal vs. distal distinction in both the past and future tenses, and a complex participial scheme involving a part of speech he calls “nounals” that are noun participles which carry verbal tense information and are separate from adjectival participles which also carry tense information. But the real pièce de résistance of the Hopyratian grammar is found in its noun classes . . . .
I’ve been fond of the concept of noun classes ever since I first read the essay “The Analytical Language of John Wilkins” by my favorite author Jorge Luis Borges, in which he describes the Celestial Emporium of Benevolent Knowledge, a fictional ancient Chinese encyclopedia in which the world of animals is divided into fourteen categories: (a) those belonging to the Emperor, (b) embalmed ones, (c) trained ones, (d) suckling pigs, (e) mermaids, (f) fabulous ones, (g) stray dogs, (h) ones included in this classification, (i) ones that tremble as if mad, (j) innumerable ones, (k) ones drawn with a fine camel’s hair brush, (l) others, (m) ones that have just broken a flower vase, and (n) ones that resemble flies from a distance. My good friend (and conlanger hero) David Peterson tells me his favorite conlang he’s created for Hollywood so far is Irathient (from Syfy’s Defiance show) because of its eighteen noun classes including sentients, plants, and animals—each of which distinguishes dangerous from non-dangerous—as well as places, abstracts, diminutives and augmentatives, and over a half-dozen more. But I’m afraid Irathient doesn’t hold a candle to David Tait’s Hopyratian when it comes to being a “class” act. I sat open-mouthed as I read through Tait’s tables of Katýcarem, the suffixes and infixes that indicate his fourteen “animate” classes and fifty “inanimate” classes, each of which inflects for number and case as well. In addition to the more straightforward classes of animals (-sa/-sū), royalty (-kenu), races (-vikā), military ranks (-efto), and occupations (-gio), the “animate” classes include languages (-ia), celestial bodies (-fūro), fictional characters (-nū), government positions (- oso), sounds (-inu), genders (-asa), relationships (-xa), health (-hū) and life-stages (-da). And the Hopyratian Weltanschauung becomes even more Borgesian when we examine the “inanimate” classes, including allegiances (-nýg), art (-vel), cleanliness (-edut), clothing (-dāg), completed processes (-vus), emotions (-aj), glass (-of), indents in the Earth (-xac), injuries (-in), jewellery (-og), lengths of time (-et), magic (-mag), ongoing processes (-vuf), personalities (-ion), rooms (-fem), scents (-aul), states of mind (-gerv), weather (-mūn), and over thirty more. Now that’s a noun classification scheme—quirky and odd enough to fall into what I think of as the “weird enough to be believable” department. Delightful! In October 2014, an official Dothraki guide will be published; it is a conversational language course created by David Peterson. You can pre-order the book directly from its LivingLanguage website. Jason Wells-Jensen, an ESOL and linguistics instructor at Bowling Green State University in Bowling Green, Ohio, collaborated with Tex Thompson on bits of three languages for her debut fantasy novel One Night in Sixes, which is being released this month. You can read more about the book on the Publishers Weekly website or on its Amazon page. Jason was recruited for this job in October 2013 via the LCS Jobs Board. D.R. Merrill’s science-fiction novel Lamikorda has received a number of positive reviews and comments on Goodreads, including its own discussion thread. Visit the book’s site for excerpts and links to purchase ebook or paperback copies, as well as a link to the Kiitra language site. JS Bangs’ fantasy novel Storm Bride will be coming out later this year from Red Adept Publishing and will be available as paperback and ebook from all online retailers. The book is set in the conworld which contains Yivrian and several other conlangs. Congratulations to the family of Jim Hopkins! His son Zak and fiancée Melissa were married on June 28, 2014. Jim composed an “Itlani Wedding Blessing” in verse (Zar Ukumú Mu Eyla) and delivered it in Itlani and English at the wedding reception. It was quite popular and many guests took copies for themselves. Both families are very aware of his conlanging and involvement with the LCS. Varem vey parem vutova lulyaven. Mu eyla say ta zaridéyn onyazha. Mu nikh, mu zakh, mu talmenshún. Kenatyaren rinkasún vey ta pronú. Teynilu ta gidanit afakuna mogí. Mu nikh, mu zakh, Burakhenún! Two doves have come together. It’s love and respect that calls them here. Into one nest for life forever. One soul, one heart, one dream. Two families sing a new song. Two great joys unite as one now. A party complete with dancing and song. And so let us heartily join this feast! Imbibing this drink to slake our thirst! To show them our love as we rejoice! One soul, one heart, one Blessing profound! WorldCon is being held in London (LonCon) August 14-18. While the event is not strictly devoted to conlanging, there will be a lot of conlanging enthusiasts at the convention (not to mention the conlangers who live in London even if they won’t specifically be at the convention). Sylvia is organizing a get-together for conlangers on August 15 at 3:00 p.m.; the location is still yet to be determined. If you are interested in getting together, please email Sylvia at terjemar@nullgmail.com. The first Summer Esperanto Study (SES) in Russia is being held August 17-25, where they will host workshops and teach all levels of Esperanto. More information can be found on the SES website. In June 2014, the word conlang was added to the Oxford English Dictionary. Mike Bacon began a new blog for his conlang, Kardak; you can find the blog here. There is also an accompanying Tumblr page with beautiful photographs of the written script for Kardak. There is an LCS Tumblr in the works; keep your eyes out for that new website! If you are interested in hosting the next LCC, please remember that the deadline for venue proposals is August 31, 2014. For more information about the proposal, please see the LCC Host Checklist. 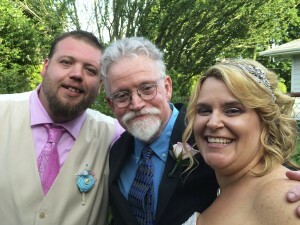 I had the VERY great privilege of actually HEARING Jim give his Two Doves of One Nest blessing at Zak and Melissa’s special day and I must point out that due to Jim’s fluency in Itlani, it is not simply a “text” but rather a full-fledged original poem composed natively and lovingly in his magnum opus. I wish you could all hear him recite it. It’s a pure aural and spiritual delight! BRAVO! Shaleyla, Sukko!